Decades of U.S. nuclear weapons production have exacted a heavy environmental toll. The Department of Energy estimates that cleaning up waste and contamination resulting from production activities will cost over $150 billion. Yet even once that money is spent, these sites will need long-term attention to assure protection of human health and the environment. In the authors' words, stewardship refers to 'institutions, information, and strategies needed to ensure protection of people and the environment, both in the short and the long term.' Probst and McGovern make a compelling case for establishing a formal program of long-term stewardship for contaminated sites. Their report details the requirements of a successful stewardship program and discusses the daunting technical and political challenges facing such efforts, including the designation of an institutional home for key stewardship functions. The legacy of environmental damage is considerable; hazardous waste disposal, radioactive waste, and contaminated facilities are among the problems that will remain after DOE cleanup efforts are complete. 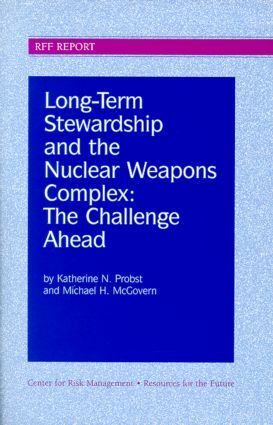 Stewardship planning, according to Probst and McGovern, must start now.